The version number is displayed at the bottom of the Manage Add-ons window. Go to Chrome, Preferences and you will be on the “Settings” page for Google Chrome. Recently, a Google employee identified a critical vulnerability in the Cisco WebEx Chrome plugin that could affect NYU users. The flaw allows outside attackers to run unauthorized browser code and potentially expose computers to malware risk. 2. Click More at the top right of your Chrome browser. 3. Select More tools Extensions. 4. Next to the extension you want to remove, click Remove . If an extension has an icon in your Chrome toolbar, you can right-click the icon and select Remove from Chrome. Please check this site for updates on this issue. You may also contact security@nyu.edu or call the NYU IT Service Desk at 212-998-3333 with questions. Use unique passwords for each site. Hackers will attempt to use compromised credentials obtained in a variety of sites. Using unique passwords helps manage the exposure of other accounts. Use a password manager. Using an encrypted password manager is the best way to manage long, strong and unique passwords. Password managers make the access and use of stored passwords easy. For more information on password managers, click here. There are no true secrets online. Use the postcard or billboard test: Would you be comfortable with everyone reading a message or a post? If not, don’t share it. Know what you’re sharing; safeguard others as well as yourself. Be sure to check the privacy settings on all of your social media accounts to prevent unintentional over sharing about yourself or others. Some accounts may have a wizard to walk you through settings. Keep your work and personal data separate. Use a non-work or personal e-mail account for private e-mails. This helps to ensure uninterrupted access to private e-mail if you switch employers. Worms, viruses, trojans and ransomware are all different forms of malware. Malware is malicious software that can infect any device. For more information on malware and preventative measures, please view the following (approximately 3 minute) Sans video of the month on Malware. This video will be available to view throughout the month of January. Please share it with your friends and colleagues! The NYU IT Office of Information Security was recently made aware of a privacy issue relating to shared documents/folders in NYU Box. Please note that this NYU Box privacy issue has been corrected, but it may take some time for Google’s cached search results to update and for the correction to be reflected. If a user selected People with the link as the share setting, the document/folder would have contained the above-mentioned privacy vulnerability. 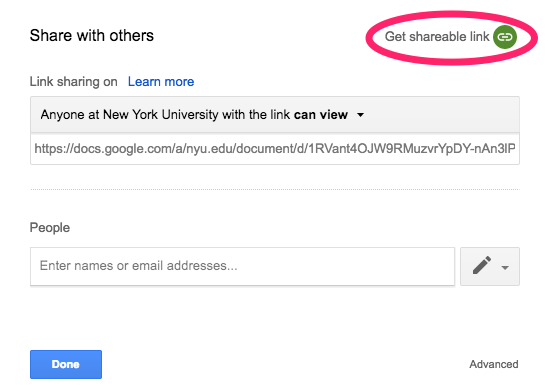 Similarly, please be aware of the following, if a Google Apps documents is shared with others via a shareable link, in conjunction with the link sharing setting “ On – Anyone with the link”, this link could be retrieved and the document could be accessed by anyone. 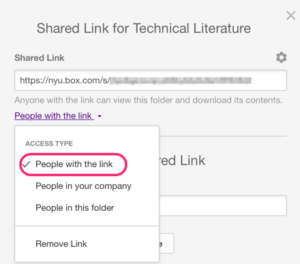 For example the File, Share option in Google Apps shows the option to obtain a shareable link along with the following default settings. 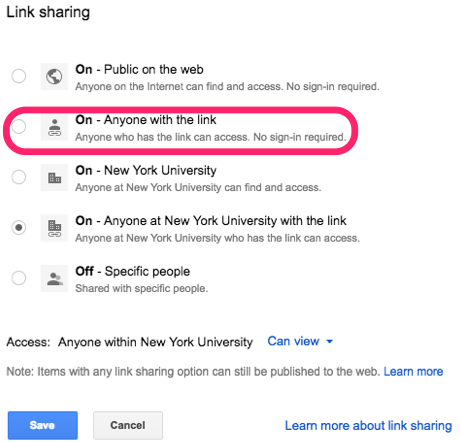 If a user chooses the Get a shareable link option (above) and then selects the On – Anyone with the link option (accessible via the drop-down arrow to the right of Anyone at New York University with the link can view), the document will contain the above-mentioned privacy vulnerability. Please be reminded that the “On – Anyone with the link” sharing option is not the default, so in order to be impacted, you have to have made the changes detailed herein. Additionally, although there is no simple way to check if your NYU Box documents/folders have been overshared, you can always modify share settings if necessary. On the Google Drive side, please be advised of the Drive-Eye add-on which is a tool to help identify Google files stored in your NYU Drive that have been broadly shared with the NYU community and beyond. Once files have been identified by Drive-Eye, you can open the document(s) from the report and change sharing settings if necessary. For more information, please see the following NYU Knowledge Base article: NYU Drive: Finding and securing shared files.